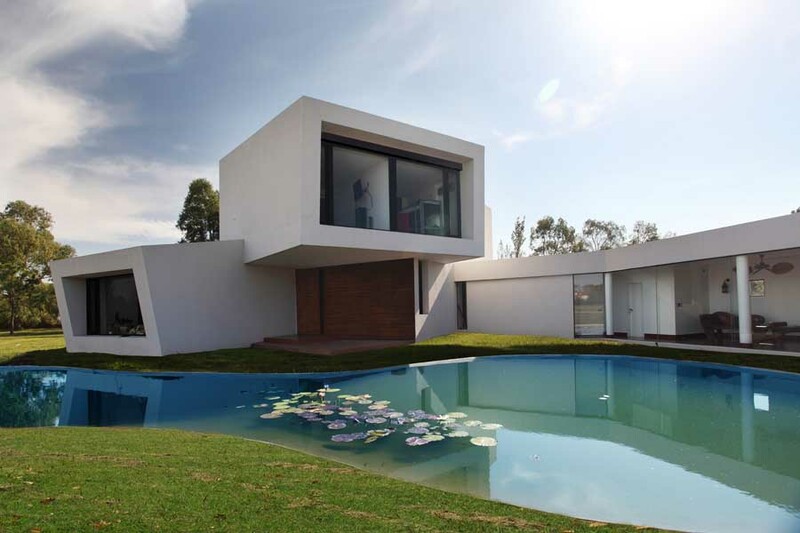 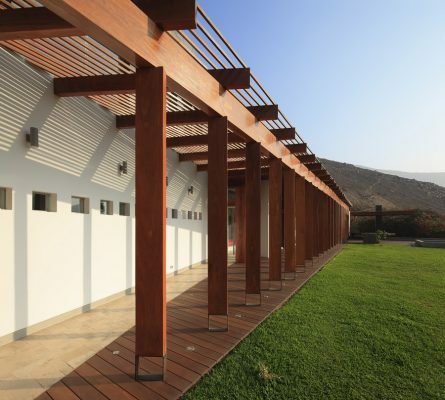 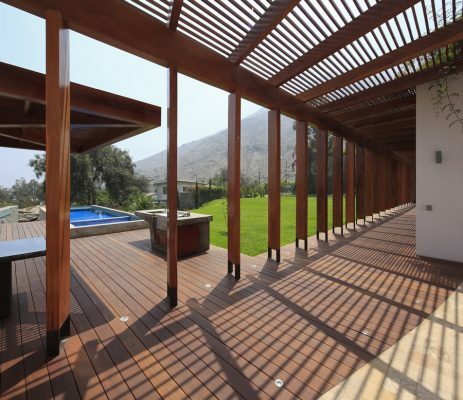 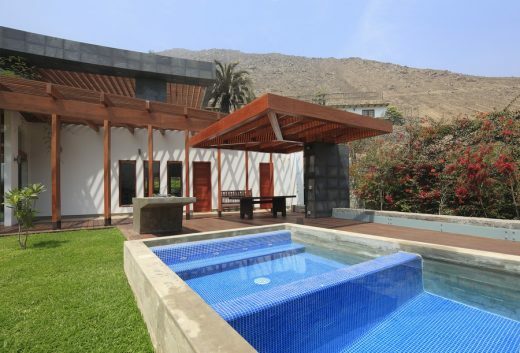 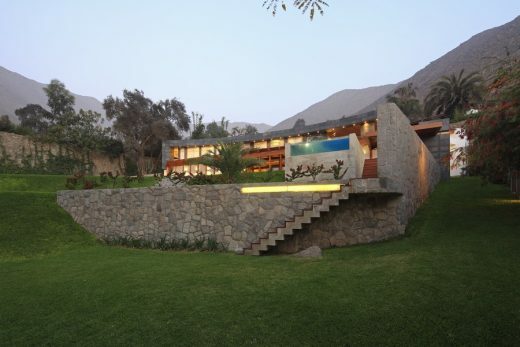 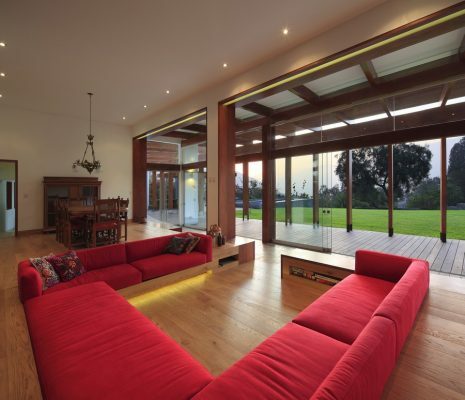 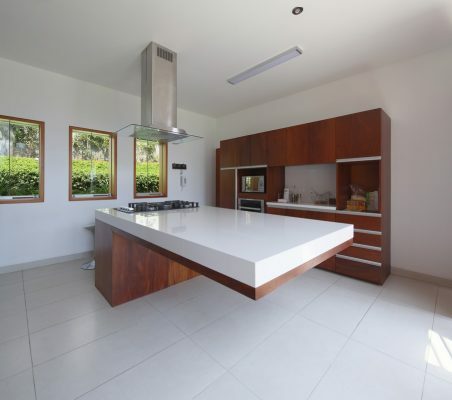 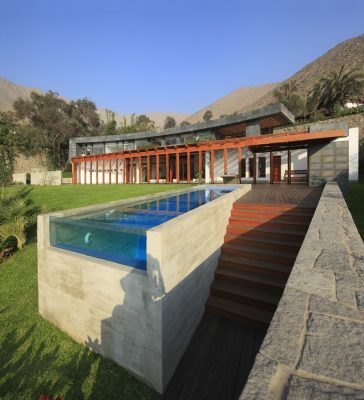 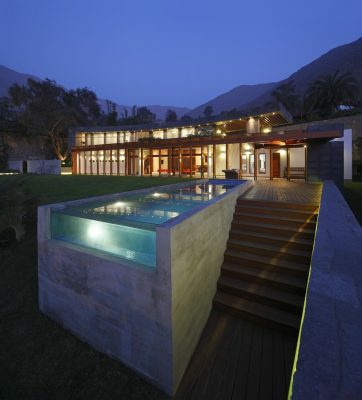 The CyD House project is a 470sqm summer home in the Los Cóndores Country Club of Chaclacayo, north of Lima. 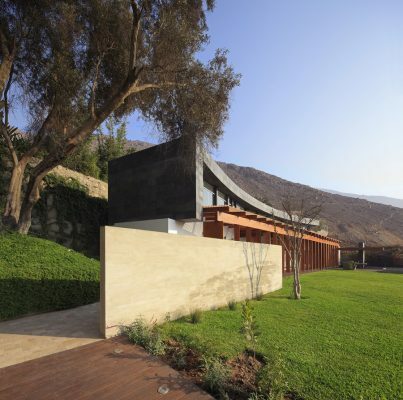 The site measures approximately 2500sqm, presenting an irregular geometry and steep inclines, the most dramatic of which is a land depression rife with obsolete cisterns. 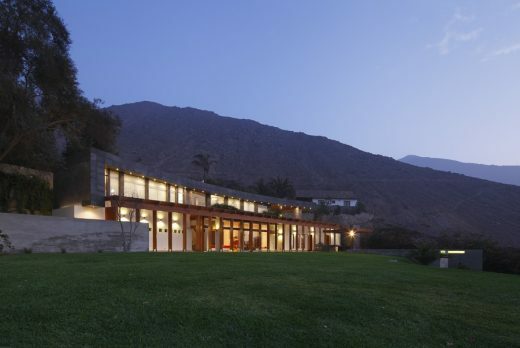 To best reintegrate the unoccupied area of the lot – its main asset – the architects pushed the house up against the adjacent hill’s steepest front in order consolidate the spaces before and below its line of vision. 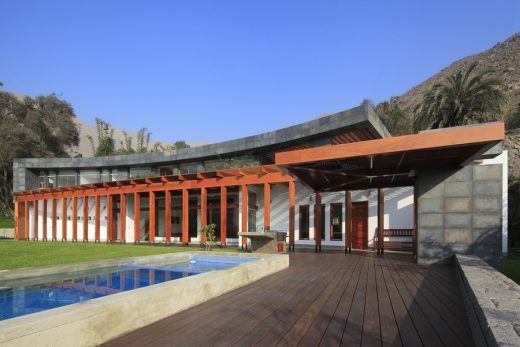 Using a very strong symmetry, the house’s shape consists of two V-shaped wings that adjust to the terrain’s perimeter, maximizing the flat garden area in the front. 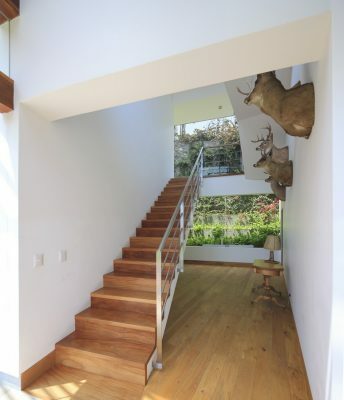 The entrance is at the far left. 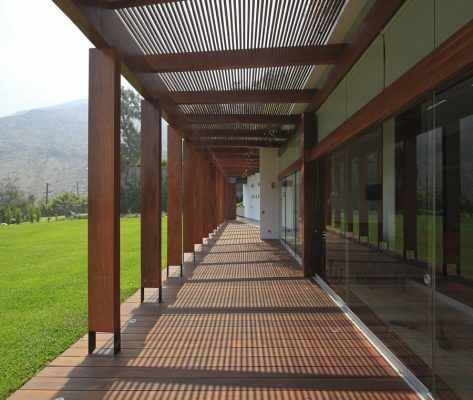 A lengthwise, partly-covered gallery runs along the house, integrating all its social areas, namely, the vestibule, the living and dining rooms, the kitchen and the terrace. 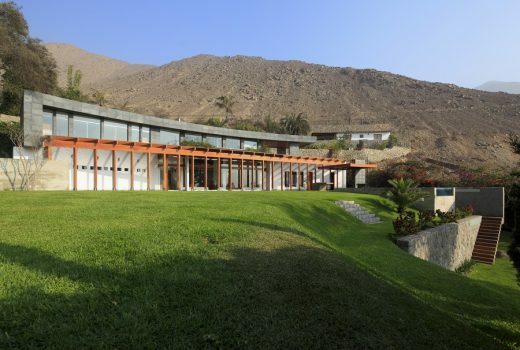 The second story holds the private areas: on the left wing are the children’s quarters; on the right is a family porch and, at the center –capping the volume with the greatest hierarchical importance– lies the master bedroom, with a privileged view of the valley. 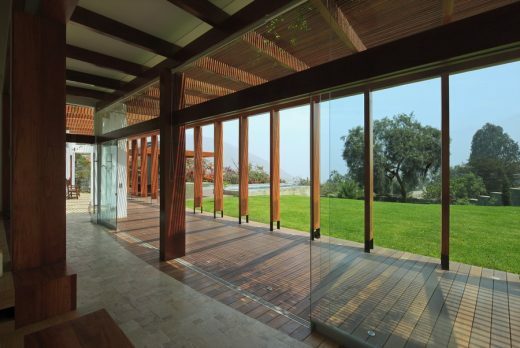 The house was commissioned by a patron whose passion for wood pushed the architects to explore its many uses and expressions. 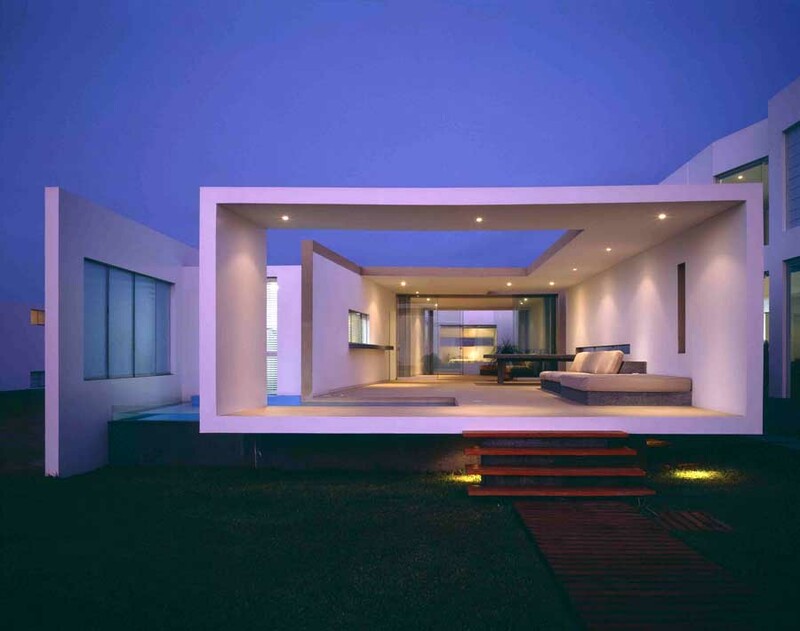 Every joint was designed to be invisible to best generate a seeming balance amongst pieces set or juxtaposed against each other. 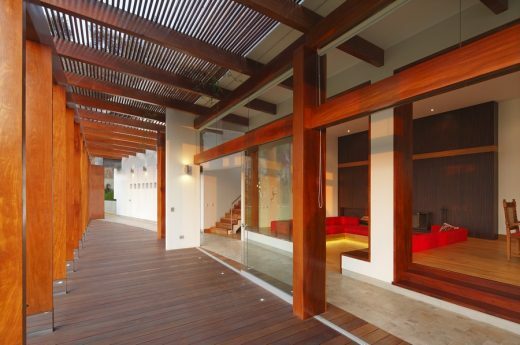 The wooden columns rest on an empty Corten steel frame whilst the terrace’s columns, floors, and beams are all made of Brazilian teak (Dipteryx odorata) of different densities, such that the natural knots, skeins and streaks of the wood attain a maximized expressive power. 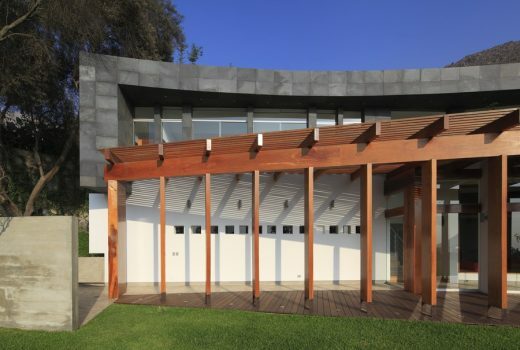 The different shades of wood used by the columns in the gallery also plays with a gradient of shading through angling and distance to work as a sundial. 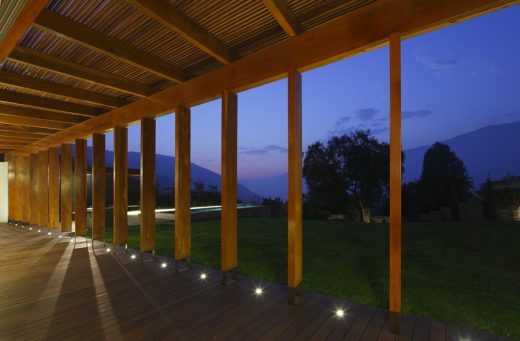 Deep-veined wooden planks were used to form the concrete walls that frame the standout olive tree at the entrance. 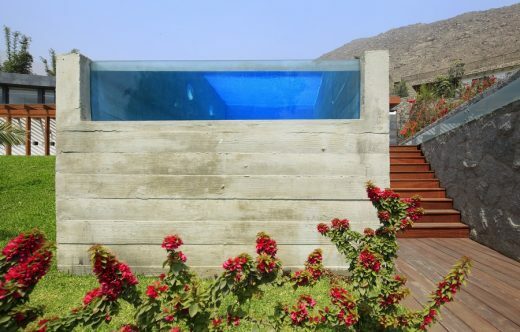 The pool received an identical treatment on its concrete side walls, and its floor and back were specifically treated like a swatch of blue mosaics. 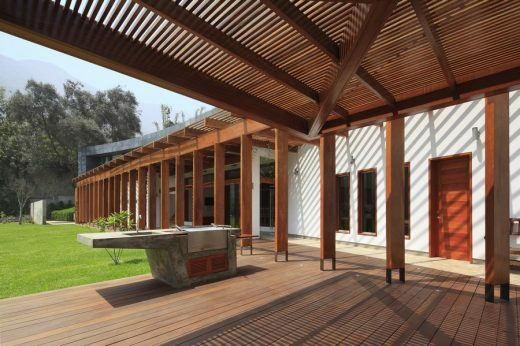 The potted bougainvillea on the the second floor will thrive and lend a lush, colorful levity to the space below them once they are grown.